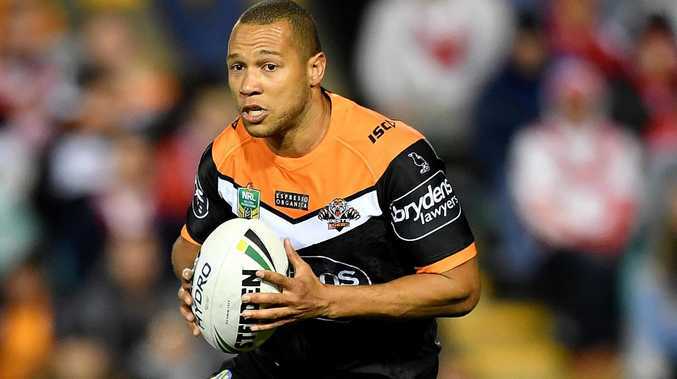 Wests Tigers coach Michael Maguire has made the shock decision to appoint Moses Mbye as captain just seven months after the fullback joined the NRL club. Mbye was on Friday named as part of a leadership group including Luke Brooks, Chris Lawrence, Benji Marshall, Russell Packer and Robbie Farah. However it's the decision to install Mbye, 25, as the leader that is seen as a surprise given his arrival at the club from Canterbury last July. Maguire, who himself only joined the club in October, admitted considering keeping the five-man leadership group of last season. "I've actually done that at other clubs and it's been successful," Maguire said at the club's season launch on Friday. "But I thought at this moment in time, I wanted to have one leader." Maguire described the former Canterbury utility as not only having bought into the club culture, but has forged strong relationships with his teammates. "He's been able to get around to every single player, whether it's the most senior player to the youngest player, to the administration," Maguire said. "That's the type of player and character and person I want in the organisation. "Whether or not you're the most senior player or the youngest player, how much are you going to give to this club? How much do you want to do every single bit possible to make sure this club is going to succeed to where we want to go? "And that player is Moses Mbye." Mbye, who, with Brooks is the only player signed beyond the 2021 season, described receiving the honour as one of the proudest moments of his career. "Growing up, it was a dream of mine to play one game in the NRL, so I consider myself extremely fortunate to have had the career I have so far," Mbye said. "I feel privileged to captain a club with history as rich as Wests Tigers, and to be recognised in this way by my teammates and coaches is truly humbling." Weather IF YOU fancy a last-minute trip away this Easter, make sure you travel away from the coast.